I am in bed typing this post, a worn out 20 year old throw that I used since I was 5 years old comforting me and a pineapple and mango coconut crumble sitting on the bedside table. Piping hot, so much so, that you can you still see the juice bubbling. With custard on the side. Crumble with custard. ALWAYS with custard. We have had stormy weather on and off and today is one of those days. You may have even heard on the news last week when Tanzania was issued a tsunami warning. Incessant rain, dull grey skies, a few strikes of thunder. Such a contrast to the bright blues I posted about last week. Maryam is enthralled with this weather and glued to the window, sticking her hands out of the grill to catch a few drops every now and then, giddy with excitement. You see, Dubai has never experienced rain like this before. Capturing little sparkly drops in her tiny palms. I am still in Dar es Salaam, having extended my trip by a week. Although I have been taking photo after photo to show you my second home, my country, I have really missed this space. This blog, writing. YOU. And so, here I am. Doing what I love. 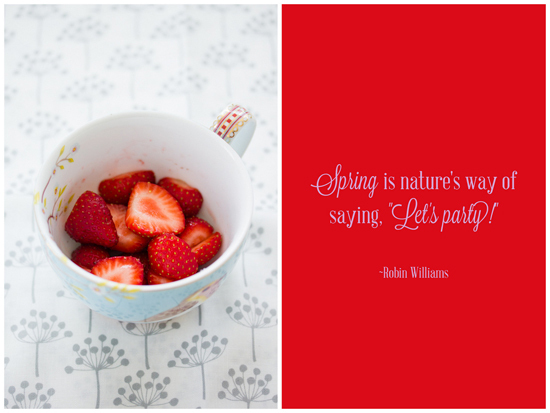 You must be wondering then where these bright spring inspired images of strawberries have come from? 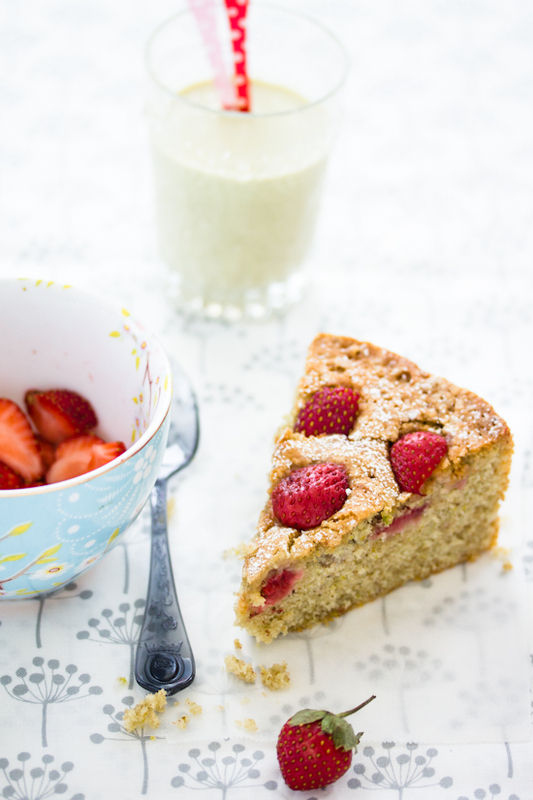 It was a strawberries and pistachio cake I baked a few weeks ago before leaving Dubai. BBC Good Food Middle East did a short interview with me for their April issue and asked for a spring inspired recipe. I knew I wanted to do a fruity dessert. Light and refreshing, oozing with fruit. 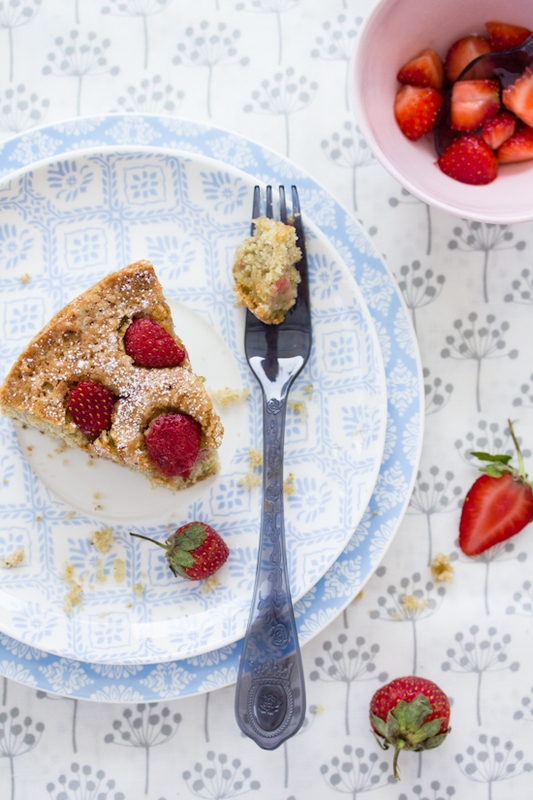 And so this strawberry and pistachio cake was born. 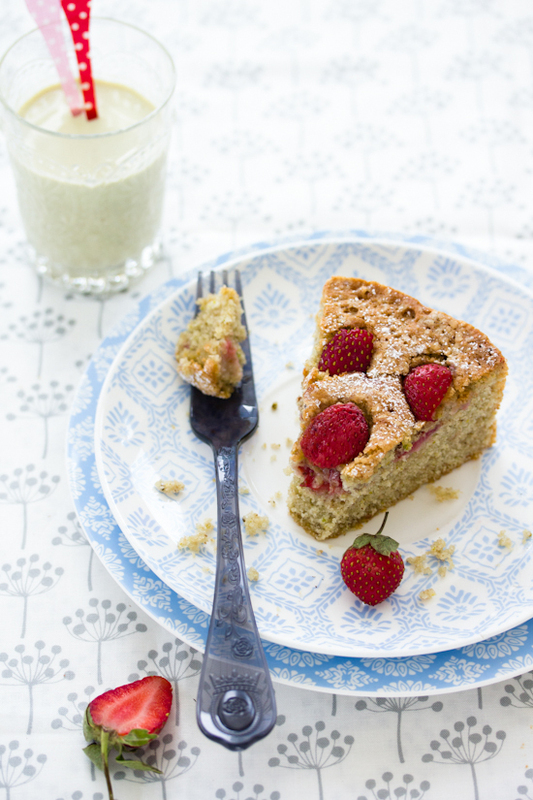 A simple cake elevated by using ground pistachio meal and raw pistachio milk. Then generously studded with tiny fragrant berries on top. 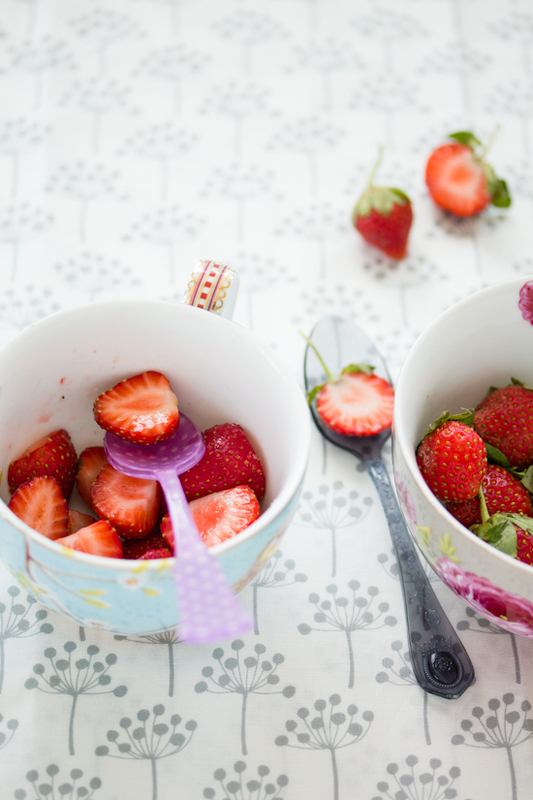 The red of the strawberries and the jade green pistachios makes for a striking visual picture. No frosting needed here- just a simple dusting of icing sugar and a warm cup of tea. And as for that crumble I mentioned earlier- well I’ve already polished that down. Slurping the last bit with creamy custard as I type. But I’m sure I’ll be making it again when I head back home. To savor the taste and the memories of home. With Tanzanian pineapples naturally that I hope to take back with me. Catch you when I’m back in Dubai. Preheat the oven to 180 degrees Centigrade and grease a 9 inch cake pan with butter. In a bowl, mix together the first four ingredients. Using the paddle attachment on your stand mixer, beat the butter and sugar until creamy. Add eggs one at a time, beating well after each addition. Scrape sides of the bowl if necessary. With the mixer speed on low, add the pistachio milk alternating with the flour mixture until just mixed. Stir in the pistachio meal. 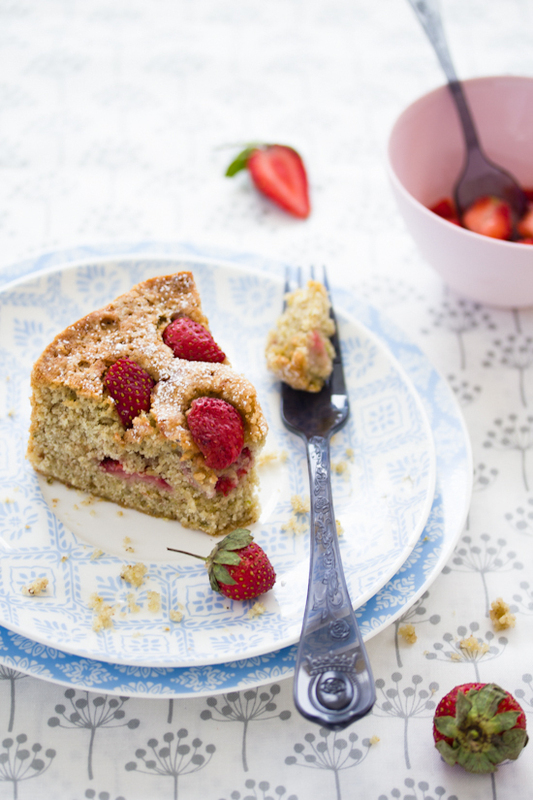 Put batter into cake pan and place strawberry halves on top of the batter. Press them in very slightly into the batter. Bake for approximately 50 minutes or until skewer comes out clean. Cool on a wire rack. Beautiful photographs as always. So evocative... and so hunger-inducing. A delicious looking and sounding cake! Perfect with a cup of tea or coffee and for sharing with friends or family. I love this recipe so much. I think I will substitute pistachio milk with almond milk. I haven't seen pistachio milk in Hungary! This is indeed a stunning cake! I love those colors and the cute, tiny berries on top! Dubai is a desert? The whole world is experiencing strange weather and not just Dubai. Even if Dubai was a desert, it certainly is working its way around it, or else there won't be many people "living" in it. Don't you think? Tanzania is one of the places I would love to visit. My father worked there many years back. 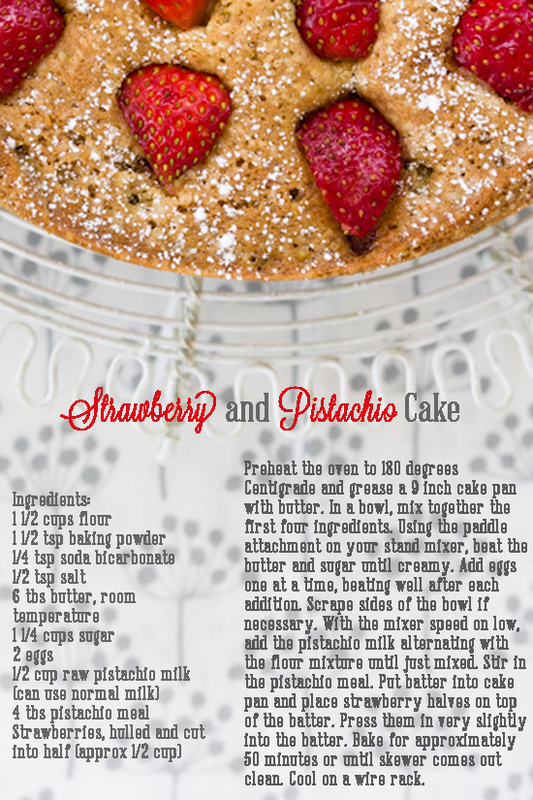 The combination of pistachios and strawberries looks delicious! Awesome cake for the #berrylove bloghop! It must be very tasty with the salty touch of the pistachios, yum! This is gorgeous. 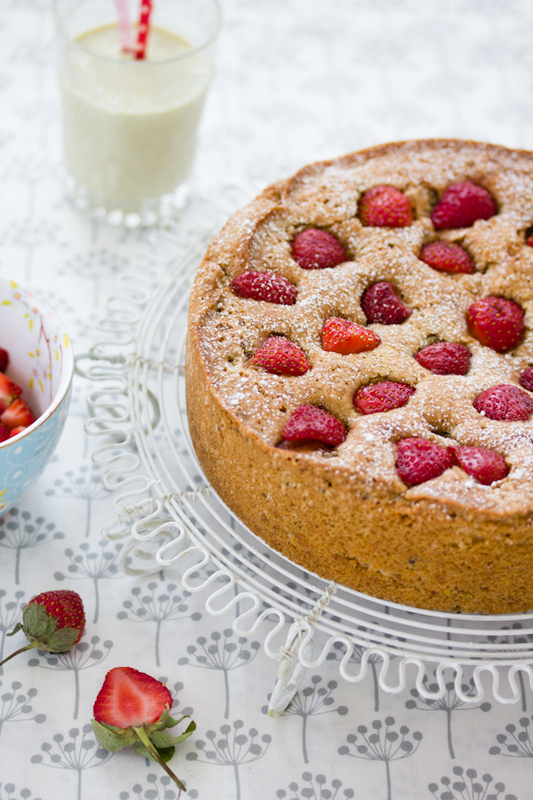 I'd always been taught never to try cooking strawberries as they go soggy, but then I tried a cake with them in while I was in Prague and suddenly realised it was all a lie - they're lovely baked into cakes so they ooze all their sweet syrupy juice into the batter. Never thought about the combination of strawberries and pistachios but I can imagine it's wonderful. Wat a gorgeous ,elegant and beautiful cake..
What a gorgeous recipe! I've never heard of a cake using pistachio milk, so unusual, but I bet so delicious! Enjoy the rest of your holiday and congratulations on the BBC Good Food feature. 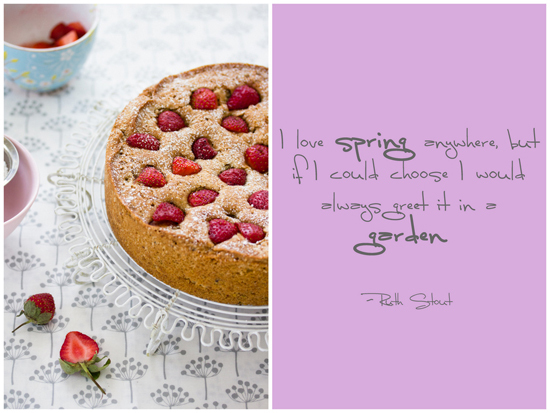 That sounds like the PERFECT spring cake, even if it feels like summer arrived over night in Colorado. And we've missed you! I'm glad you're safe. Sorry to hear the weather has been so frightful What a mess. But this cake... how majestic. Pistachios are one of my favorite ingredients and here they are used so elegantly. 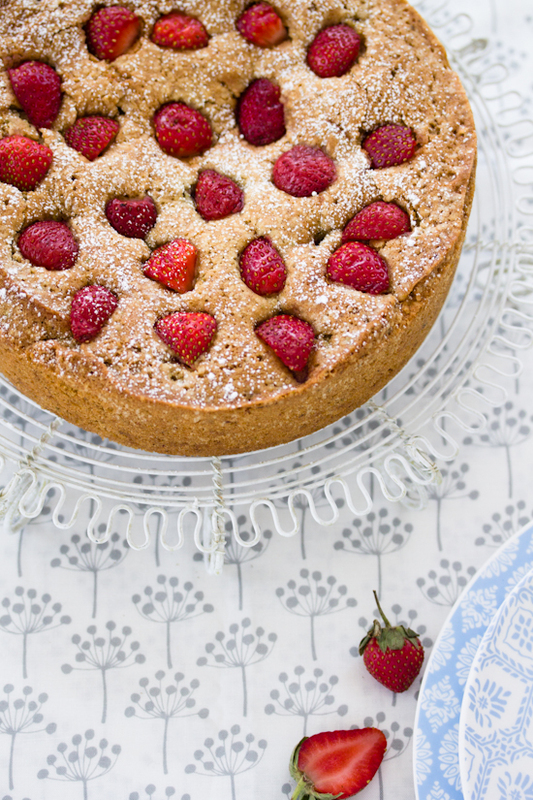 delicious, what a perfect spring inspired cake, I can't wait to bake it! Was waiting for this cake post since the time u mentioned pistachio milk!!! As usual, this must be another delicious cake! The pics look divine.. Need I even mention we missed you??? Have a fun week... Missing u in action back here! Hugs to the lil ones! So a beautiful cake!! and lovely pictures!! I have to hunt for Pistachio milk in the supermarket this weekend! How beautiful! I can almost see you nourishing that crumble & custard. 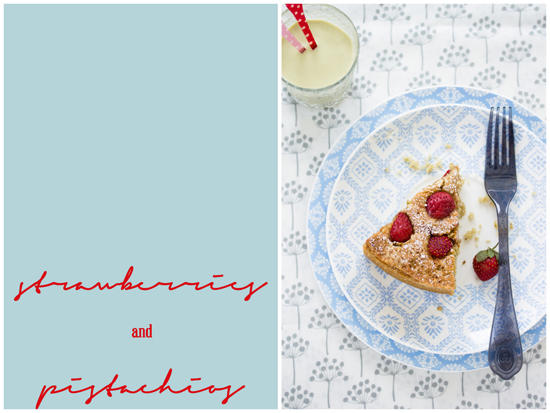 Pistachios & strawberries- what more can I ask? The cake looks divine! Take care my dear! Okay, seriously making pistachio milk now. Why have I never done that before? This looks divine! What a gorgeous looking cake and your pics are just stunning . Gorgeous cake and equally gorgeous photography! Love it! Gorgeous photography ,look forward to making the cake..have a great day..
Sukaina, I made this cake yesterday for a food party at work! Everyone loved it and they are already requesting the scrumptious cake again! Some minor changes I made to the recipe include: almond milk instead of pistachio milk and I coarsely crushed the pistachios to give the cake a little crunch effect. Thank you for the inspiration! Where the heck can I find pistachio milk and meal in London England? Hi anonymous. Sorry for the late reply. You can make pistachio milk at home by soaking 1/2 cup pistachios in 2 cups water overnight. Whiz in a blender and sieve. You could also substitute pistachio milk with plain or any other nut milk. Hope that helps. Thanks for all the comments peeps. Yum, your cake looks absolutely gorgeous - I love your photos! I am an amateur who loves baking and experimenting with desserts. I just tried my hand on this scrumptious looking cake and i must say it lived up to my expectations! :) except that strawberries sinked into the cake... any tip to avoid this? Hi AAB- You could lightly dust the strawberries in flour (shaking off any excess flour) and also make sure not to push the strawberries into the batter too much. Even perhaps just put them on top of the batter. Glad you liked the cake though. Apa Saja Penyebab Kanker Serviks? Bagaimana Cara Mengobati Terkena Wasir? Apa Efek Obat Benjolan Ambeien Ibu Hamil?